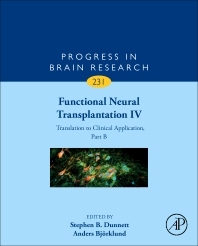 Functional Neural Transplantation IV: Translation to Clinical Application, Part B, Volume 231 provides the current status of cell transplantation in the nervous system, focusing on the conditions for achieving structural repair and functional recovery. New to this edition are chapters on Plasticity and Regeneration in the Injured Spinal Cord After Cell Transplantation Therapy, Transplantation of GABAergic Interneurons for Cell-Based Therapy, Rebuilding CNS Inhibitory Circuits to Control Chronic Neuropathic Pain and Itch, From Transplanting Schwann Cells in Experimental Rat Spinal Cord Injury to their Transplantation into Human Injured Spinal Cord in Clinical Trials, and the Recruitment of Endogenous CNS Stem Cells for Regeneration in Demyelinating Disease. As the fourth in a periodic series of updates at 5-7 year intervals, this volume highlights recent developments in cellular and molecular science, providing the fundamental principles of neuroplasticity and regeneration in the brain and spinal cord, while also addressing the power of pluripotent stem cells to generate new sources of precisely specified neurons for utilization in brain repair. As a neuroanatomist and developmental neurobiologist, during the 1970s Björklund’s lab originated reliable methods for transplantation of embryonic tissues into brain that pioneered practical cell transplantation in the central nervous system, providing the basis for technologies that are now used by laboratories world-wide. In parallel, work in the field has progressed from basic anatomical and developmental studies in experimental animals, via applications for assessing cell replacement and repair using primary and stem cells in the damaged brain, and now underpinning the majority of methods in development for cell therapy in patients. His laboratory continues to analyse the fundamental neurobiology and principles of cell transplantation, regeneration and integration in the CNS, as well as originating the first trials of effective clinical cell transplantation (for Parkinson’s disease) in patients.